Coach Ray Knight was born and educated in Bermuda. 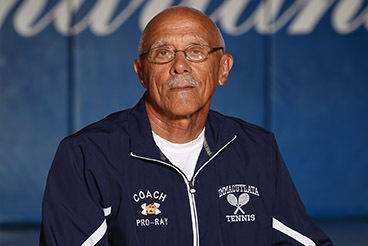 Coach Ray Knight has coached girls and boys tennis at Immaculata for the past three years at Varsity Coach. A certified PTR Certified Tennis Professional, Coach Knight worked as a Tennis Pro/Facility Manager in Bermuda, before moving to the United States. Since then, he has served as a Faciility Manager/Teaching Professional at area tennis facilities. He was worked with dozens of young tennis players for years as a Tennis Pro at summer camps. In addition, he has managed and coached all levels of Adult and Junior USTA tennis teams. The highlight of this experience was reaching the USTA Jr. Team Tennis National Championship twice, winning it all in 2009.